If you enjoy playing golf in unusual destinations then a new 18-hole course located in Leh in the State of Jammu and Kashmir, to be be completed next year, could be just the thing. The Chief Minister, Omar Abdullah Monday, hopes to optimise sports tourism in the area, which also boasts golf courses in Jammu, Srinagar, Gulmarg and Pahalgam. He has requested that more tournaments be organised to help encourage visitors to the region. 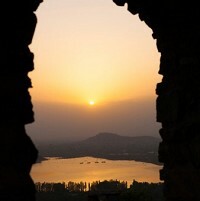 Tourism in Jammu and Kashmir is more commonplace now that peace has been restored to the State. Travellers are drawn to the area's natural beauty, although the region's tourist facilities are developing fast. Visitors can take out sports travel insurance to ensure they are covered for any mishaps that may occur. Omar Abdullah was speaking at the prize-giving ceremony at the end of the Sher-i-Kashmir Golf Tournament. He encouraged golfers to play at the beautiful Royal Spring Golf Course in Srinagar, founded by Dr Farooq Abdullah. Over 70 players participated in the tournament, which was organised by the State's Tourism Department. If you are looking for an adventure then this could be the place for you.